EASY TO USE: With cutting Teeth EVERY LINK it is a human powered chain saw! – this amazing little device EATS wood and weighs nothing!! Its flexible, compact and works like a charm. Just wrap the blade around the branch and move it back and forth – Eats tree limbs for breakfast !! Extreme Portability – The effectiveness and compactness of this product is where it shines. If you let the chain do the cutting and just move it back and forth you will be amazed at what it can do. WHERE TO USE: Use at Home, Away, in the Garden or Wilderness. Never go hiking or camping without this AWESOME Pocket Chainsaw. Its great for yard work as well. If you prefer it can be worn on a belt. Cuts like butter and it’s perfect for backpacking, cutting wood for the fire and it is fun to use. A great item for your go bag. It would also be great to keep in the car or truck for emergencies – e.g. fuel shortage this hand powered Pocket Chain Saw will be unaffected by the lack of fuel. SURVIVAL KIT: This is a great item to have in your backpacking or camping bag. It is lightweight, strong, flexible and functional for many different occasions. Its recommended for anyone who is interested in prepping, survival tools, or just plain camping in general. Great for emergencies and for everyone’s go bags and even survival kits. Excellent size and weight for my bug out bag. This 24-inch saw is in a convenient pouch that can be tucked inside a backpack. MISC: This is a nice lightweight and compact survival saw. The chainsaw eliminates awkward sawing positions in tight spaces. Great for sea kayak or backpacking trips where weight is a factor but you still want to be able to cut wood for a fire. Handy to have one available when needed. Another good feature is that you can slip cordage through the loop handles and throw it over higher limbs and just pull and saw away. Lifesaver when you need to start a fire in inclement weather. Finally ! Your search for the perfect Pocket Chainsaw is finally over. You will be more than happy when you purchase the Stunning Gadgets Pocket Chainsaw today and here’s what you should do. A delivery from Amazon comes to your door. You know that feeling of anticipation ……..open the beautiful packaging as quickly as you can to reveal whats inside. Now, this is the important bit – take out the contents carefully and just sit still for a moment whilst you admire it. You can instantly tell that this is something special from the overall design of the product and all the benefits you are about to witness. It is so easy to use and these are the reasons why: With Cutting Teeth Every single link it really is a human powered Chainsaw ! – this amazing little device EATS wood and weighs nothing!! Its flexible, more compact than many others. It works like a charm and easy to use. What separates Stunning Gadgets Pocket Chainsaw from the competition? Its simple really. It starts with the Design, the Materials of construction to the packaging and the outstanding customer service. This Pocket Chainsaw looks different and feels different from the competition. The fact is – it really works ! It does exactly what its says on the tin. 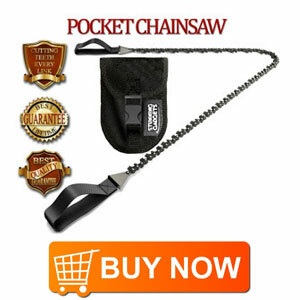 Now its because of our belief in our product that we are able to make a guarantee unlike any other you’ve seen for a Pocket Chainsaw – We call it our better than money back guarantee and here it is ……Try our Stunning Gadget Pocket Chainsaw for as long or as little as you want. If you are not completely satisfied in that time or you don’t feel it was worth every single penny of your investment we will refund your money no questions asked. This Guarantee is in place to protect your new investment and this is why we call it the Best Lifetime Guarantee. ..and consider getting two Pocket Chainsaws one for you and one for your best friend.